Party through the January Blues! Yeah we know, it's getting to the end of the month now. Chances are you were paid before Christmas and had to spend it all last minute on relatives you don't really like. So it's getting tight and we feel your pain. Thankfully, we here at Gadgetinspector have amazing prices all year round, not to mention our January sale which is still going on! A reason for celebration no doubt. Time to break out the party gadgets perhaps? We've got all sorts of social accessories and gadgets for your get together, be it a selection of Beer Bongs, a smattering of Shot glasses or a variety of (literally) the coolest gadgets money can buy; Ice cube trays. We've even got those classic 16oz Red cups if you're feeling particularly nostalgic! See? 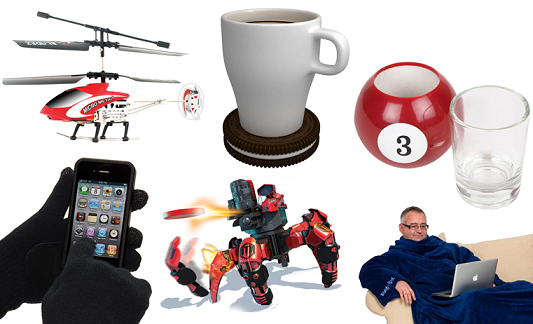 There's not reason to feel glum, January's nearly over so why not have a gadget filled party to celebrate. After all, you've earned it! Huge discounts and fantastic gadget offers throughout the month! Ready for an exciting announcement? We hope so, because our January Gadget Sale is now open! January's a pretty miserable month, what with the winter weather and the sudden absence of Christmas cheer, so here's hoping that a bucketload of fantastic gadget offers will make the next 31 days or so a little easier to bear! The Glow In The Dark Beer Pong Table is usually £149.99, but for the duration of the January Gadget Sale, it's yours for a mere £105.99. That's a saving of £44! The super-cool Combat Creatures Attacknid [no longer available] has an RRP of £69.99 but, in the name of gadget offers, we're currently letting it go for just £37.99! This Remote Control Spy Helicopter is down from £59.99 to just £35.99, saving you a cool £24. Fly around and spy on your friends and family! That's just the tip of gadget sale iceberg. There are plenty more great gadget offers where they came from, so have a browse through and see what you could save on gadgets this January! So Christmas has come and gone, and we're left with an inevitable case of the post-Yuletide blues. All the wrapping paper has been torn off, the decorations will be coming down soon if they haven't already, and our festive portion sizes are beginning to look like regular old gluttony. January's here, ladies and gents, and it's not nearly as much fun as December was. But not to worry! There's still plenty of fun to be had in this harsh, post-Christmas world, and you'll find a blooming' big bunch of it right here at Gadget Inspector. Are you disappointed with your Christmas toys? Then get some new ones, like the Inflatable Remote Control R2D2 or any of our Remote Control Helicopters. Sad that the steady flow of parties has stopped? Throw your own party with our Party and Drinking gadgets! And if, like so many people, you're just upset that it's still winter for another two months, we've got a remedy for that, too. This gadget website is full of wonderful winter warmers; whether it's the USB Mug Warmer, the sumptuous Snug Rug, or the thermal yet functional Touch Screen Gloves, we're bound to have the perfect winter gadget for you. Whatever you need to get you through the dregs of the season, you'll find it here at Gadget Inspector.